Can the Super Protector Plate Cover Defeat Radar Cameras? See how this product compares with similar products. 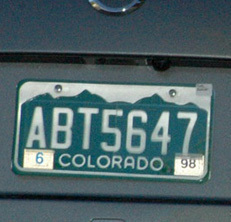 Photo radar camera's violation photo of Colorado plate covered by Super Protector. Rating: "...ineffective against radar"
Super Protector plate cover. Rating: "...ineffective against radar"
Billed as an "all-in-one solution against Photo-Radar", this plate cover employs two sections of prismatic material. Each covers half of the plate and the two are opposite-phased, intended to obscure half of the plate no matter whether the camera is low, high or to the side. Like the Original Protector, it's easy to spot. The Super Protector had no effect on our photo radar: it obscures the plate only from very steep angles, far above the industry standard of 20 to 22 degrees. Although we didn't test this way, it's probably effective if the camera is mounted on an overpass or high on a pole, making for a more-extreme angle. Cameras like these are very rare in the U.S. but if they constitute the primary threat, it's possible a Super Protector may offer some protection.